Bog cotton is found on blanket and raised bogs in Ireland. It comes in two forms single headed and many headed bog cotton. The two plants are very similar, with white fluffy cotton seed heads and grassy leaves which are seen from June each year. The white cotton flowers with seeds attached are easily dispersed by the wind. Many headed bog cotton grows in bog pools. The plant has air canals in its roots which allow air to pass from the parts of the plant sticking out of the water to the roots which can be buried up to 60cm into the wet peat. The plant is adapted to living in the bog pools by “snorkling”. The leaves of Many-headed bog cotton are wider from 2 to 5 cm, and have rusty red tips. Single headed bog cotton grows on the drier surface of the bog and does not have these air canals. Instead many plants of Single headed bog cotton grow tightly packed together to form a clump or tussock on the bog surface. In this way the plants create a drier environment for themselves. But the disadvantage of this growth form is that the plants have to ensure that they do not die from summer drought on the bog. The leaves are specially adapted to conserve water. They are long and rolled into needles. In winter the leaves of single and nany-headed bog cotton die back from their tips. All of the food in the plants is recycled and stored over the winter in underground bulbs ready for the spring growth. This is a special adaptation to the nutrient poor bog environment. This bushy evergreen plant with tiny, scale like leaves which are packed together, overlapping like the tiles on the roof of a house, produces purple flowers in autumn, the flowers are wind pollinated. It can be found on the drier hummocks of the bogs. Its tiny leaves are covered in a waxy coat to conserve water as the peat at its roots can sometimes dry out during the summer. Its flowers produce a nectar which is a favourite of bog insects, such as the emperor moth and green hair streak butterfly. Its green shoots are eaten by the red grouse and other bog animals. The fruits are like capsules and contain the seeds. The roots of ling heather are interesting because they are surrounded by a mesh of fungal threads which grow into the roots and assist the roots in obtaining minerals and water from the peat in exchange for sugars produced in the leaves of the heather. These are called mycorrhiza. Ling Heather conserves nutrients on the bog by having evergreen leaves. This means that the plant uses the leaves to make food for more than one year. The latin name Calluna comes from the Greek word kalluno which means to sweep. In the past ling heather was tied into bundles to make brooms and brushes for use in the house. Bog moss is the most widespread plant on the bog and the most important in the creation of bogs. Each moss plant has a distinct head, a long stem and many branches all of which are covered in tiny leaves. Moss begins to grow in areas where other plants cannot as it is adapted to the low level of plant nutrients and waterlogged conditions. 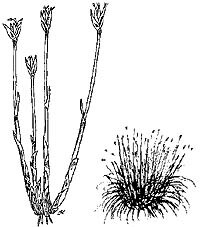 On the bog mosses grow continuously upwards and the parts of the plant underneath do not decompose because the organisms that decompose plants cannot live in bog conditions. This build up of moss after time turns into a type of soil which is called peat and this process over thousands of years forms the peatlands we have today. Bog moss act like a sponge and soaks up as much as 20 times its own weight in water so helping to keep the bog surface wet. The water is stored between plants that growth together in cushions or hummocks and it is also stored in special cells inside the leaves of the plant. Sphagnum moss operates a kind of “mini laboratory” on the bog. The plant absorbs all of the nutrients found in rainfall by exchanging them for Hydrogen ions. Hydrogen ions are acidic and they help to make the water on the bog even more acidic. Sphagnum moss comes in many different colours and in places appears to carpet the bog surface. In pools individual plants of the moss float free in the water. On hummocks the individual plants are packed tightly together in a cushion to keep them from drying out. Sphagnum mosses produce spores in tiny brown sacks which are released into the water and these form new moss plants. This plant has yellow star shaped flowers with six pointed petals seen in July and August. They are found on the tips of tall stiff stems. Later in the year, the spiky nut-like orange fruiting heads are seen. The flower heads were once harvested and used for dyeing. 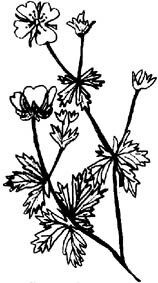 The leaves are pointed and shaped like a sword are bright green and seen in spring. At the end of summer they turn orange before they die. All the nutrients are stored in bulbs along underground stems from which the new leaves grow in spring. This is an adpatation to conserving nutrients on the bog. 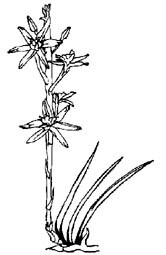 Bog asphodel grows at the edge of bog pools in Sphagnum moss where there is some movement of water. The latin name ossifragum means “bone breaking” and is said to refer to the fact that animals grazing in the bogs where the asphodel thrives suffered from foot rot because of the lack of calcium in the peat. A small plant, with bright yellow flowers and woody roots. Tormentil grows in the drier parts of cutaway and blanket bogs. The flower has 4 yellow petals and it flowers all summer long. the leaves are divided into 5 and have toothy margins. Tormentil has a underground stem that is reddish when cut and has a rose like smell. A red dye was extracted from it and used to tan hides in the past. The English name for the plant comes from the Latin word tormentum meaning pain, which refers to the use of the underground parts of the plant to relieve stomach pains and toothache. Deer sedge has long needle like leaves with brownish grass like flowers at the tip. It grows on blanket and raised bogs in clumps or tussocks in drier parts of the bog. In parts of bogs that are burned regularly deer sedge tends to dominate over other plants. 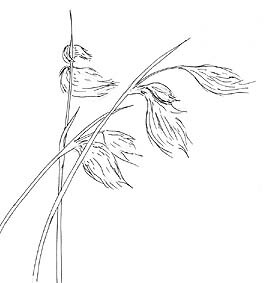 In winter the leaves of deer sedge die back from their tips. All of the food in the plants is recycled and stored over the winter in underground bulbs ready for the spring growth. This is a special adaptation to the nutrient poor bog environment. This small plant which produces the cranberry fruit in autumn and lasts until spring is a eaten by many bogland animals and birds. It has small green leaves on a long stem which winds and creeps through other plants. The cranberry is found on raised bogs. Cranberry leaves are rolled downwards at their margins and the pores on the underside of the leaves are protected by white hairs. These features of the leaf help the plant to avoid drying out and dying during the summer months when the surface of the bog becomes drier. This plant is a grass. It is very common on blanket bogs. It has wiry stems and hairy leaves that taper to a point. 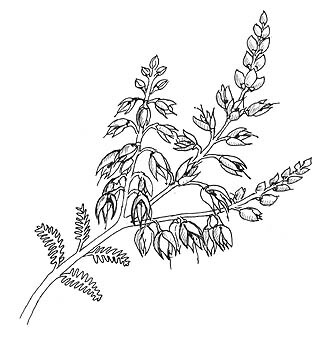 The plants varies in height from 15 to 120 cm and may form large clumps. The flowers appear in August and September and the flower spikes are about 15 cm long. These purple flower spikes give the plant its name. In autumn the leaves turn golden brown and are then very similar to straw. At the base of each blade of grass an over wintering bulb is found. Each year a new blade grows from this bulb. This recycling of plant nutrients is a special adaptation to the nutrient-poor bog environment. Cross leaved heath is found on raised bogs growing at the edge of bog pools and through Ling heather. 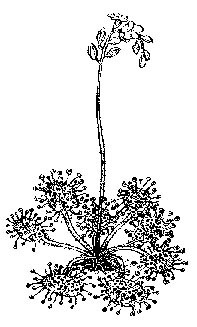 It has a long stem with leaves which are evenly spaced and arranged in fours on the stem so that they resemble a cross. The leaf margins are rolled downward. On the underside of the leaves there are silky white hairs which help to reduce water loss from pores in the leaf by trapping air between them. The flowers are tightly packed together at the top of the stem. They are pink and shaped like bells. The flowers can be seen from May to September. This is a small carnivorous plant that grows on blanket or raised bogs, in and around bog pools. It has green spoon shaped leaves covered with up to 200 red tentacles. These are glands which are sensitive to touch. These glands produce a sticky substance which attract midges and other insects which are trapped on the hairs. Within 3 minutes there is no escape for the insect. The whole leaf bends over and closes up, this may take a day to complete. The soft parts of the insects body are then digested by the plant. After one or two days the leaves open and the hard parts of the insect are all that remain. On average a sundew plant traps up to 5 insects a month. The tiny white flowers appear on flowering stems about 7cm tall in July and August. The fruit is a capsule. Long ago the sundew was used as a cure for warts. A lichen is an association of an algae and a fungus. This is called symbiosis which means two organisms who need each other to survive. The alga provides the fungus with food and the fungus absorbs water for the alga. Lichens are blue, green or grey in colour. Lichens can be found growing on hummocks and rocks in bogs. They are also found growing on dead wood. Lichens are crisp when dry and soft when wet. Look out for cup shaped lichens, bearded lichens, antler horn lichens and match stick lichens on the bog. Lichens have no roots or pores. They need to absorb water and air through the plant walls. For this reason they are sensitive to pollution.